Ever since I learned how to crochet a few years ago, I’ve loved making new hats for my kids every winter. This year, I knew the hats had to be Pokemon themed, since both my kids are going crazy over the TV show and the collectible cards. 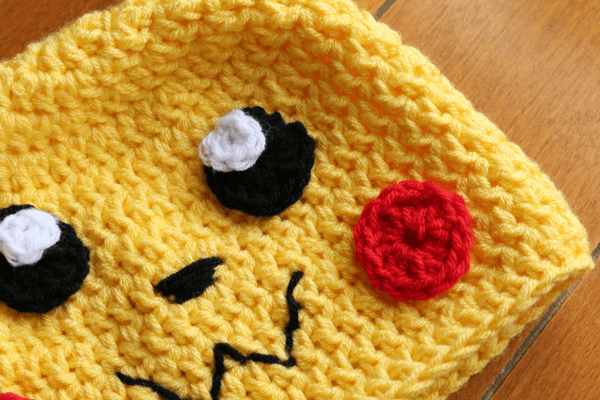 Luckily, one of my favorite YouTube crochet video channels put out a tutorial for a Pikachu-inspired hat, which I knew would be perfect for my son. It took me just a few hours to put together, and both he and his friends really love the hat…so much so that I’ve had a few hints that I might get an order or two for a hat. This hat came together in practically no time; although it looks complicated, it’s really quite easy. The longest part was sewing all the pieces on at the end! One change that I made to the hat pattern was to make the hat with a double strand of yarn, in order to make it thicker to withstand some of the harsh wind that we tend to get in the winter. Rather than buying two skeins of yarn, I used just one skein, mainly because I didn’t want to have a ton of leftover yarn. I simply unwound the yarn until I thought I had about half of it off the skein, cut it, then rolled it into a ball. While crocheting, I used yarn from both balls as though it were one strand, and followed the pattern as show in the video. 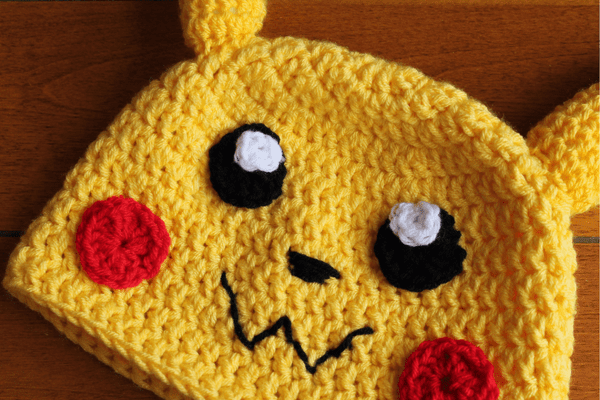 Although I loved this hat pattern, I didn’t think it looked as close to Pikachu as I wanted, so I adjusted my eye and mouth placement a bit, based on a photo of Pikachu that I found online. This hat is not only fun to wear, but it’s really warm as well, which makes it much easier to get my son to wear his hat on really cold days! If you know a Pokemon lover, I hope you’ll try making this for them. It’s a great gift, and most likely will be very unique too! That is such a cute hat. I always hat crocheted hats my mom made me when I was young. I’m sure your son loves that you can make him hats too. With all the cold weather we’ve been having I’m glad my kids have a few hats to wear. I knitted my son a hat with ear flaps on it, at first he didn’t like it but when the cold weather came he changed his mind. I also knitted a hat for my husband’s uncle, he wanted one that was warmer than the ones he could find at the store. I haven’t made any character hats for my kids yet. This one looks so cute. The hat with ear flaps sounds great! I hate it when my ears get too cold that I can’t feel them anymore. Character hats are so much fun to make. 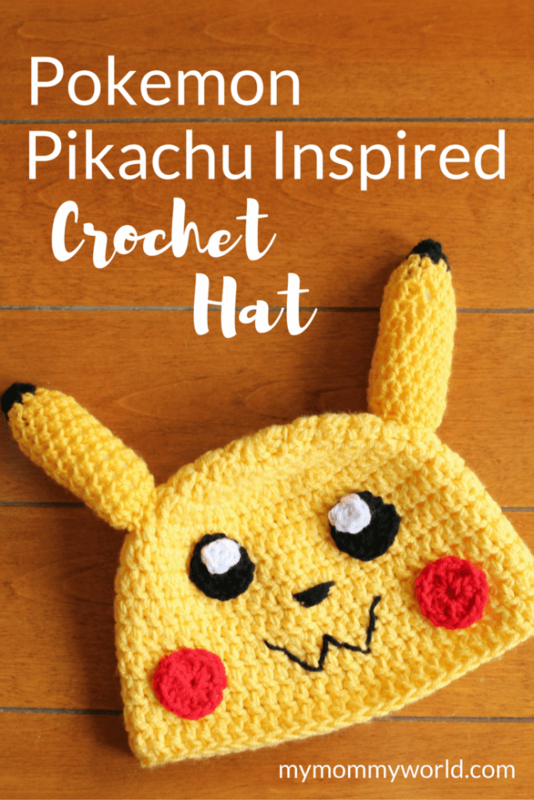 They’re the reason I learned how to crochet…I didn’t want to pay $30 for a homemade hat on Etsy! I made another Pokemon hat for my daughter (a pink Jigglypuff…whatever that is! ), but I didn’t realize that the pattern was an adult size. It’s a bit too big for her, but she still wears it.